This year, I started working at Bustle Digital Group. In media, as with a lot of products, the engineering team builds a platform that should support all use cases. Our CMS provides capabilities for authors and editors to create articles as well as curate pages, and control ad injection. Unlike working with a static site, the engineering team doesn’t have full control over what data comes in from the user, so design decisions and governing rules must be made for a good user experience. Some of these scenarios we’ve faced in the digital media space have really inspired me to look into ways of using CSS to solve those UI challenges, and that’s when solutions involving this idea really came into my periphery. So let’s take a look at some examples! An often forgotten and very useful selector is the :empty pseudo selector. It allows you to style elements based on if they contain any content, or if they don’t. Hello empty states! Empty states are a great way to reach out to your users and show personality in your app, and you can inject that personality right from your CSS. Drawings illustrate conditionally applied styles based on no items (left) versus displayed items (right) in the list. You can also add a :before pseudo element to inject images or any other content you may want. Alternatively, the :not pseudo selector may be used in combination with :empty to create a :not(:empty) rule and style all elements which are not empty, and therefore do contain children. See the Pen Empty States by Una Kravets (@una) on CodePen. Note: This demo is for display purposes only. It is not advised to put content in pseudo elements for accessibility purposes. You can use the same technique of targeting :empty or :not(:empty) elements to apply styles to child elements that are more accessible to screen readers. That was a nice soft ball example, but we can get much more complex than this binary choice of child elements in CSS, and to do this, we will use the :nth-child pseudo selector! CSS-Tricks has a great tool to help you test and play around with the :nth-child selection, and it can really come in handy as some of the examples will show you. But before we get into those, how exactly does this work? Illustration of how :nth-last-child(3) selects the third item from the end of the list. 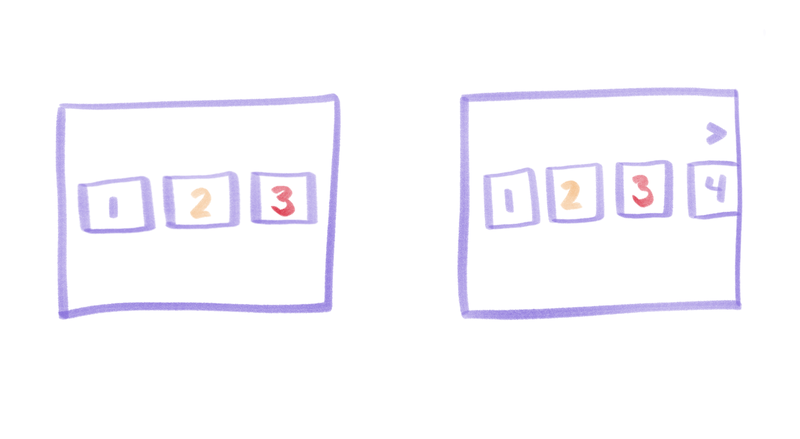 Illustration of how :nth-last-child(n + 3) selects items that match the condition of being the third item from the end or greater. Uh oh. We only have the first item selected at this point, and we want to select all of the items. Luckily, we can use the super handy adjacent sibling selector (~) for that! Adjusting our last example to :first-child:last-child(n + 3) ~ * selects all items excluding the first like we want. Combining both of the previous two examples will select all items in the list. Say you want to list some credits at the end of an article. You’ve got some space to fill, and most articles have a small number of credits, but there are those exceptions that have a high production value and a lot of people involved in the making of them. We want to make sure both of these are good visual experiences, and can do that with CSS alone. Here’s the plan: if there are four or fewer credits, list them in bullet format. Let them take up vertical space to fill the block appropriately. Once we have five or more credits listed, let’s turn that list into a horizontal format to not get too overwhelming for a reader. This is a small credits box after all! 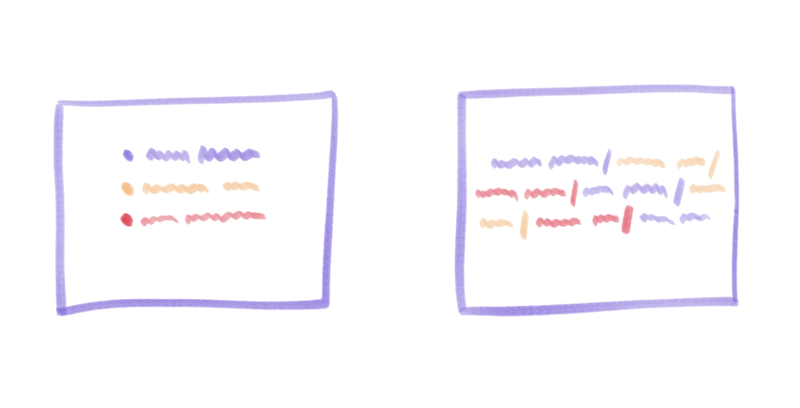 Illustrations of a vertical unordered list (left) and a horizontal list separated by semicolons (right). We can check out the number of elements we have available and style them as block elements until we hit our cap. At that point, we’ll switch to inline styling, and add a pseudo element to visually break up the data. :nth-first-child:nth-last-child(n + 5) allows us to state: “start with the first child and apply styling to that child and every sibling after it if the original child matches having five or more siblings.”” Is that confusing? Well, it works. li:first-child:nth-last-child(n + 5) selects the first list item, and li:first-child:nth-last-child(n + 5) ~ li selects each list item following the initial one. See the Pen vrQBMv by Una Kravets (@una) on CodePen. Using this technique, let’s style a carousel to be responsive. At a large size, you want it to be centered in the middle of page when it has three items within it. But when it has enough items to fill the screen horizontally, let it be left-aligned for the user to swipe through it. Illustrations of a carousel with three items (left) and more than three items (right). See the Pen Box Alignment by Una Kravets (@una) on CodePen. In my research for this post, I discovered an excellent post by Heydon Pickering about this technique, called Quantity Queries, and another example by Lea Verou! In the comment thread of Heydon’s post, Paul Irish notes that this is a slower way of selecting elements, so maybe use it with caution.